SAN FRANCISCO (June 22, 2017)—City Attorney Dennis Herrera expects a court order today compelling ride-hailing company Uber to provide Treasurer José Cisneros with business records to ensure its drivers are following the law and obtaining a business license. San Francisco Superior Court Judge Richard Ulmer said from the bench this morning that he will rule that the Treasurer and Tax Collector’s Office has the authority to subpoena driver contact information and that the information serves the valid purpose of investigating whether drivers are complying with the law. After hearing arguments, Judge Ulmer told the parties he would adopt a tentative ruling he issued yesterday that found the subpoena is not overly broad and that Uber had failed to show that the driver information requested constitutes a protected trade secret or that disclosure would violate drivers’ privacy or due process rights. Judge Ulmer directed Uber and the city to meet and confer on the date for the company to produce the information and to report back to him by July 3. Starting in August 2014, the Treasurer and Tax Collector’s Office requested information from ride-hailing companies like Uber and Lyft about their drivers to investigate compliance with the city’s business and tax code. Uber provided that data until December 2016, when it abruptly refused. On Jan. 26, 2017, Treasurer José Cisneros and Tax Collector David Augustine issued a subpoena to obtain the information. The subpoena was modified on March 20, 2017 at Uber’s request, but the company refused to comply and instead went to court May 1, 2017 trying to quash the subpoena. Herrera’s petition filed on May 11, 2017 in San Francisco Superior Court sought a court order compelling Uber to comply with a subpoena from Cisneros’ office seeking limited information about the company’s drivers who operate in San Francisco: their name, business address and driver’s license number. That will help determine whether Uber drivers doing business in San Francisco have obtained a Business Registration Certificate from the Treasurer and Tax Collector’s Office, which is required of any business that operates in the city. Uber argued that it could not turn over the information in order to protect its drivers’ privacy, an argument the court flatly rejected today. All non-public data submitted in response to a subpoena is treated as confidential taxpayer information. Uber has steadfastly maintained that its drivers are independent contractors, not employees. As contractors, drivers who operate more than seven days a year in San Francisco are independent businesses required to obtain a Business Registration Certificate. Drivers typically pay a $91 annual fee for the certificate. Once a business is registered, information like the name of its owner and its business address is posted on a Business Registration Certificate, which must be posted in the place of business. The city also makes that information available on a city website so the public has basic information about the business. There is no requirement for an independent contractor to provide their home address on their Business Registration Certificate. Today’s ruling is separate from the subpoenas that Herrera issued on June 5, 2017 to Uber and Lyft to turn over records on driving practices, disability access and service in San Francisco. In that action, Herrera is seeking to ensure that the two companies’ estimated 45,000 vehicles in San Francisco comply with local and state laws, including ensuring equality of access, and do not jeopardize public safety or create a public nuisance. Lyft is engaged in discussions with the city on their response. Uber raised a host of objections and has so far declined to produce documents in response to the subpoena. The City Attorney’s Office is reviewing the company’s response. Today’s case is: City and County of San Francisco v. Uber Technologies, San Francisco Superior Court, CPF-17-515663, filed May 11, 2017. 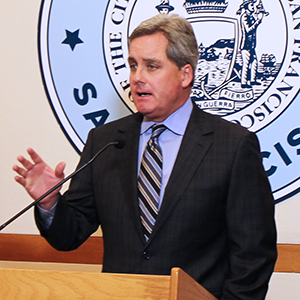 Additional documentation from the case is available on the City Attorney’s website at: https://www.sfcityattorney.org/.